I love caps. I love flat-billed caps, loud caps, classic caps, oddly colored caps, throwback caps, caps that teams only wore one time, commemorative caps, snapbacks, strapbacks, fitteds, any. I love ’em. So when I saw via the Effectively Wild Facebook Group that there’s a sale at Lids for $10 MLB hats (word broke in the EW facebook group last night, and an email went out about the sale this morning. The price on each hat will become $10 after you put them in the cart), I had to drop everything and go shopping. At the same time I had to exercise self-restraint because these things like buying hats can quickly get out of hand. When I started perusing hats in this sale, there were 107 pages of results (there are now 102). I looked through all of them. Most designs were fairly run-of-the-mill, but there were some gems on both ends of a spectrum: hats that had to be bought at one end, and on the other, hats that were seemingly designed to be ridiculed (though I say that without the intent to yuck anyone’s yum). I’ve picked out some of the best from both ends of said spectrum and I divided this post into two sections: one of hats that made he say “what the hell is going on?” while others are ones that I would buy for NL Central Podcast participants. Love America? Of course you do. Show your national pride with this flag-adorned Washington Nationals hat. Jonny Gomes didn’t design this, but he’d probably wear it. Did you know this is a Dodgers hat? I could barely tell. Have you ever wanted to wear a rug on your head? Now you can with this Houston Astros snapback! Too bad the Florida Marlins changed their logo because this would’ve made a perfect, gaudy mid-1990s style hat that would match well with a Marlins or Charlotte Hornets Starter jacket. But alas, they are the Miami Marlins and it no longer fits. Our Ken Maeda pointed this one out – did Spike Lee do the right thing by designing this Yankees hat? 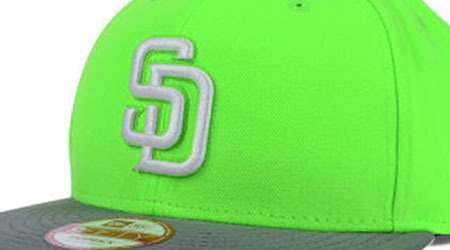 Usually I’m cool with non-traditional color schemes for hats, but what I can’t bring myself to get down with are hats with colorways that look too much like another team’s. This White Sox hat is colored like the A’s, and this Reds hat is colored like the Cubs. The Reds hat is likely outright sacrilegious, while the Sox hat is bad but it’s more like regular bad. Alex Crisafulli said he couldn’t pull of the flat-brimmed hat, but I don’t believe him. That’s why he gets this Lava Red Cardinals hat that makes him the Coolest Dad Cardinals Fan in all of San Diego. It’s loud enough to be noticed but still simple enough that you can tell it’s the Cardinals at a quick glance, and the color doesn’t veer from the standard team color that much. Eric Roseberry doesn’t wear hats. He said as much in a past episode of an NL Central Podcast. But tomorrow, if Eric decided that he wanted to wear a hat, I’d recommend that he wear this stylish Reds New Era snapback. The classic Reds logo works well with the red pinstripes much better than the versions of this hat for other teams. Plus the red bill makes everything red for the…Reds. By day, Ross Bukouricz is an accountant, but by night he is a dedicated follower of fashion (probably), befitting of this New Era denim and suede Brewers cap with the classic glove logo with “MB” hidden in plain sight. The suede bill works well for it – when you leave the house with it on, you’ll have a whole different confidence (but don’t wear it in the snow). I got myself a Cubs hat in the same line, so we could match the next time I go up to a Brewers game. For Rob Mains, now of Baseball Prospectus, I’d get the classic Pirates pillbox snapback. Frankly I’m amazed this was included in the sale, and I had to jump on it and buy one for myself. The non-traditional shape of the hat along with the horizontal stripes give this a unique look, one that hasn’t really been attempted in the years since, except on throwback nights. It’s a classic, not unlike Rob. I got myself 5 hats tonight, including this one below, which is actually being saved for a couple of years down the line when the Cubs complete their heel turn and become baseball’s villains. Sure, it might seem that way now, with more annoying fans coming out of the woodwork on the regular since the team is winning, but my stance is that without a championship, a team can’t really be the bad-guy that everyone wants to lose. How could you want a team that hasn’t won in 107 years to continue losing? (Unless of course you do.) It’s much easier to root against the team that won a championship last year, and it’s certainly alright to root against the team that won each of the last two years, or two of the last three. This hat will sit in my drawer for as long as it takes for the Cubs to win a couple World Series. I could be waiting a long time, sure, but when it happens, I’ll be right there, already past the point of worrying about the heel turn, and at the point of embracing it while wearing this Cubs Death Star New Era x Star Wars adjustable hat. The Reds used to wear blue hats for some reason back in, like, the 50s or whatever, so maybe that was the impetus for that one. Lids has lousy customer service! They do not stand behind their products. I Use a credit card when purchasing! I purchased a cap at the Lids store in Canoga Park. After a couple of times of light wear, it showed a very noticeable band of sweat. I called the store; an employee told me that taking it to the cleaners could probably solve the problem. It did not. I took the cap back to the store, explained the situation and was told they had no ability to take this defective merchandise back, I was told to call customer service. The next day I called customer service, explained the situation, and was told their policy is not to accept returns if the hat is worn or cleaned. I carefully explained to the representative that to find out it was defective I had to wear it and was told by their employee to take it to the cleaners. She said all she could do was apologize and gave me a corporate phone number. I called this number multiple times on a work day, was given automatic instructions to dial 3 for customer care. Each time the response was, there is no one available at this number. I also was given automatic instructions to dial 2 for the operator, the response was, this number is not recognized. I researched the payment method and called my credit card company. I explained the situation, while I was the line the card representative procured a credit to my card!